The general elections are just a few days away and political parties are leaving no stone unturned to ensure the mandate swings in their favour. Be it the Bharatiya Janata Party, Congress, Trinamool Congress or the Samajwadi Party, the campaigning is all heated up and interspersed with quirks, comments, remarks, and sexism. 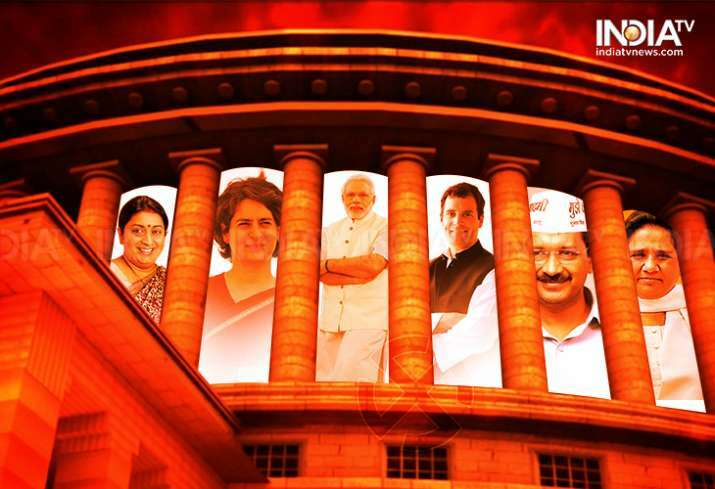 Stay tuned to this space as IndiaTVNews.com brings to you live and latest updates on the run-up to the general election 2019. The Election Commission has seized cash, alcohol, drugs and precious metals worth crores of rupees till date as part of the exercise to keep election free and fair. Meanwhile, Congress president Rahul Gandhi has filed his nomination from the Wayanad Lok Sabha constituency in Kerala. This is the second seat he is contesting the election from. He will also contest the election from his party bastion -- Amethi in Uttar Pradesh. Bharatiya Janata Party (BJP) chief Amit Shah addressed two election rallies in Telangana and held a roadshow in Andhra Pradesh's Visakhapatnam. Senior BJP leader Smriti Irani was also in Amethi where she claimed that Rahul Gandhi had insulted Amethi. Catch all the live and latest updates here. Hours after Congress president Rahul Gandhi filed his nomination from Wayanad, Uttar Pradesh Chief Minister Yogi Adityanath Thursday accused him of having a “secret agenda” in Kerala with the Muslim League, the “same organisation” which caused the country’s division. The BJP leader was apparently referring to the Indian Union Muslim League (IUML) which is a long-time member of the Congress-led United Democratic Front (UDF) in Kerala, equating it with the pre-Partition Muslim League. "The country attained freedom in 1947 after hundreds of years. But we also saw the country's unfortunate division on the eve of Independence. It was the Muslim League which had caused the division," he said. Praising party patriarch LK Advani's blog on BJP, PM Narendra Modi said that the sneior leader has perfectly summed up the BJP's "true essence" in his blog, in which the veteran leader wrote the party has never regarded those who disagreed with it politically as "anti-national" or "enemies". "Advani Ji perfectly sums up the true essence of BJP, most notably the guiding Mantra of 'Nation First, Party Next, Self Last.' Proud to be a BJP Karyakarta and proud that greats like LK Advani Ji have strengthened it," Modi said in a tweet. The Election Commission has refused permission for circulation to six campaign videos submitted by the Congress in Madhya Pradesh, including one about the Rafale row, the party said here Thursday. The party, while seeking a review of the decision, alleged that the poll body was acting under the Union government's pressure. Election Commission of India has seized Rs 399.505 Crore cash, Rs 162.892 Crore worth liquor, Rs 708.549 Crore worth drugs & precious metals worth Rs 318.495 Crore and freebies/other items worth Rs 29.342 Crore till date. "Right from its inception, BJP has never regarded those who disagree with us politically as our “enemies”, but only as our adversaries." "In our conception of Indian nationalism, we have never regarded those who disagree with us politically as “anti-national”. The party has been committed to freedom of choice of every citizen at personal as well as political level." " It is my sincere desire that all of us should collectively strive to strengthen the democratic edifice of India. True, elections are a festival of democracy. But they are also an occasion for honest introspection by all the stakeholders in Indian democracy – political parties, mass media, authorities conducting the election process and, above all, the electorate." Uttar Pradesh Chief Minister Yogi Adityanath on Thursday accused the Congress of playing into the hands of anti-national and separatist forces by releasing a poll manifesto which promises to end the anti-sedition law and dilution of AFSPA. "By saying that it would revoke the anti-sedition law and dilute AFSPA, the Congress has made it clear that it is playing into the hands of anti-nationals," the Uttar Pradesh chief minister said. Producer of film 'PM Narendra Modi', Sandeep Singh tweets: This is to confirm, our film 'PM Narendra Modi' is not releasing on 5th April. Will update soon. UP CM Yogi Adityanath in Bulandshahr: Congress President Rahul Gandhi has filed nomination from a Lok Sabha constituency of Kerala. You all know, he is an MP from Amethi, he knows defeat is confirmed, that's why he ran away to Kerala. And with whose support they want to win elections in Kerala. Congress is fighting in alliance with Muslim League in Kerala, the same Muslim League that became the reason of country's partition. West Bengal Chief Minister Mamata Banerjee Thursday said if Prime Minister Narendra Modi returned to power, he would throw away the Constitution and change the country from a democracy to a totalitarian regime. Modi has three slogans "loot", "riots" and "kill the people", she said at a rally in Cooch Behar. Poonam Sinha, Shatrughan Sinha's wife, will be contesting Lok Sabha elections against Union Minister Rajnath Singh in Lucknow on Samajwadi Party's ticket, news agency IANS reported. Shatrughan Sinha had recently resigned from BJP and is expected to join Congress in next few days. He will be fielded from his current seat Patna Sahib seat, where he will be facing a direct contest with BJP's Ravi Shankar Prasad. Congress fields Madhya Pradesh CM Kamal Nath's son Nakul from Chhindwara Lok Sabha seat, Kamal Nath to contest Chhindwara assembly bypoll. From what we hear, three journalists sustained minor injuries after a barricade at Rahul Gandhi's roadshow broke. The injured were helped to the ambulance by Rahul Gandhi. BSP chief Mayawati on Thursday slammed the BJP and RSS for portraying Prime Minister Narendra Modi as India, saying they were repeating the same mistake which the Congress did earlier. "The way Modi government and RSS are functioning, many people feel their culture, language and history are being attacked." "I understand that my brothers and sisters in CPM will now speak against me and attack me, but I am not going to say a word against the CPM in my entire campaign." "The prime minister has stolen the country's money and has given it to Anil Ambani." "I have come to Kerala to send a message that India is one, be it North, South, East or West. My aim is to send a message, there is a feeling in South India that the way Centre, Modi ji and RSS are working, its like an assault on the culture and languages in South." "I have come here to tell the people the entire nation is one. And united," Rahul Gandhi tells reporters in Wayanad. From what we hear, chaos erupted at Rahul Gandhi's roadshow. And the Congress president himself helped the injured mediapersons to the ambulance. From what we hear, a huge crowd has gathered at the roadshow currently being held by Rahul and Priyanka Gandhi. Huge crowd gathering in the filing of nomination of Rahul Gandhi in Vaynad (Kerala). "Rahul Gandhi enjoyed a position of power for 15 years because of the support from Amethi, but now he is going to file nomination from elsewhere. This is an insult to Amethi and people here will not tolerate this." "People of Wayanad should judge Rahul Gandhi's work by having a look at the situation in Amethi."